Rabbi Eli Ben-Dahan: Cemetery for the poor of Jerusalem protected sovereignty in the capital, which must now be extended to all of Israel. Deputy Defense Minister Rabbi Eli Ben-Dahan spoke at a ceremony Sunday morning at the Sambusky Cemetery in Jerusalem to mark the anniversary of the death of the Biblical figure Moses. The Sambusky Cemetery is an abandoned cemetery on the slopes of Mount Zion in which the Jewish poor of Jerusalem were buried during the 19th century. Rabbi Ben-Dahan addressed the recent spate of anti-Semitic incidents in the US during his address. He said that it was important for Israelis to show that they have not forsaken the poor of Jerusalem, "especially in these days, when we hear of incidents of headstones being smashed in [a democratic country like] the US." "We are here to restore and preserve this site. This cemetery will no longer be the forgotten cemetery of Jerusalem, but will be the burial site of Jerusalem's most precious [residents]," he said. 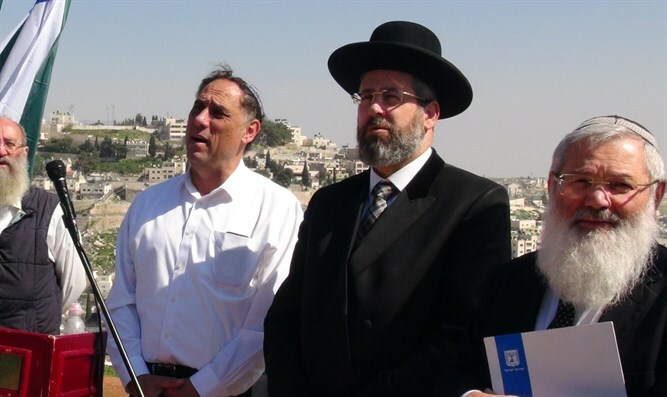 Rabbi Ben-Dahan called for the State to establish Israel's sovereignty over all of Judea and Samaria. "Those who are buried here also helped to save the holy city of Jerusalem, the eternal capital of Israel, [and retain it] under Israeli sovereignty. Just as Jerusalem is under Israeli control, we have to work so that all of Israel such as Hevron and all of Judea and Samaria, where there are many Biblical sites, will be under full Israeli sovereignty." "But right here, in front of these graves, it is impossible not to recall the Talmudic saying: 'Watch for the children of the poor, for from them shall the Torah come forth.' And I add: 'Watch over the graves of the poor, for from them shall sovereignty go forth.' A cemetery in Israel is not just a place when the bones find rest. It also has a spiritual meaning. When the patriarch Avraham, the father of the nation, sought to to something to demonstrate his ownership of the land of Israel, the realization of the promise, 'to your descendants I will give this land,' he bought a burial place for Sarah, the field and the Cave of the Patriarchs in Hevron. The graves of the patriarchs are the true basis of our claim to the land of Israel."